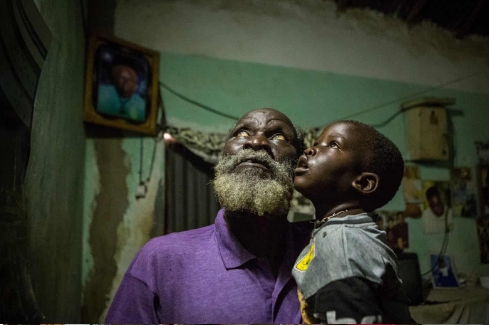 Solar power has been both life-changing and potentially life-saving for Francis Lwanga and his family. For decades, the Lwangas, who live in a typically modest rural Ugandan house, endured the noxious fumes of kerosene – the costly fuel source for vast swathes of sub-Saharan Africa, where 130 million families cannot access electricity. Each day Lwanga’s nostrils would become blocked with black soot from the kerosene-fuelled lamps. He vowed to switch to solar after one of his sons, studying late into the night, accidentally knocked over a lamp. It set his house ablaze, the family fortunate to escape death. Lwanga signed immediately when Ugandan company SolarNow approached him last year, offering to install a 50-watt solar home system starter pack – consisting of three powerful solar lights, a mobile-phone charger and a rechargeable torch and radio – for £300, paid back in manageable instalments over 24 months. Now, the Lwanga family’s future is looking, well, considerably brighter. Ethical investment – and increasingly “impact” investment that targets specific positive outcomes – is more popular than ever. Energise Africa, a joint venture between UK-based not-for-profit investment platform Ethex and Lendahand, the fastest-growing crowdfunding website in the Netherlands, helped fund the solar panels on the Lwanga family home. They raise funds to lend to businesses in different countries in Africa. Investors can participate by investing in the companies through bonds offered by Energise Africa, whose first project was for SolarNow, to support its operations in Uganda. The upside is the potential returns are higher than you would get compared to other returns in the market, and the investment is helping African communities. The downside is the risk is higher because you are investing in a company and your cash is not protected by any UK government safety net. If the company collapses, there is the potential to lose everything. Through Energise Africa, 45 investors – expecting a projected 5% return on their two-year unsecured bonds – amassed the £150,000 fundraising target, meaning that 500 solar home systems could be installed in Uganda through SolarNow. Since that initial venture, more than 40 similarly illuminating projects have been launched by Energise Africa in Kenya, Cameroon, Mali, Tanzania, Mozambique, Burkina Faso, Democratic Republic of Congo and Rwanda. Upwards of £5m in funding has been raised, from more than 1,000 ethical investors. Some 230,305 people have now been switched on to clean energy, mitigating 55,273 tonnes of carbon dioxide a year. Furthermore, almost £650,000 of repayments have already been made to investors. “Solar in Africa makes so much sense,” enthuses Koen The, chief executive of Lendahand, pointing out that in Uganda, for example, only 7% of the rural population is connected to the electricity grid, hence they use the expensive and dangerous kerosene. Solar energy provides a brighter, healthier, and cheaper alternative. Not only is it better for the family – and the world – to utilise renewable energy, solar power improves standards of living. For instance, a small household solar system saves time and money because people can charge their mobile phones at home, rather than having to travel three hours a week to the nearest kiosk. Energise Africa was established in early 2017, following an open call by both UK aid and Virgin Unite for organisations to submit proposals as to how UK-based retail investors could be enabled to lend to solar businesses. The aim was to address the problem of energy access for low-income families in sub-Saharan Africa. It wants to make ethical investing transparent and straightforward, and its crowdfunding website is both simple to understand and easy to use. “There is a growing realisation that for people to have a sustainable future they need to act urgently to address the growing impacts of social inequality and climate change,” says Berkeley-educated The. “Millennials are leading the charge, being one of the most ethically-minded generations. “Recent research from Facebook (pdf) found that, as a result of living through a financial crisis and a recession brought about by the mistakes of previous generations, 92% of 18- to 34-year-olds do not trust financial institutions. “Gone are the days when the financial return was the only consideration. Investors now want to use their money in a way that aligns with their personal values and motivations, and they want transparency as to what kind of impact their money is helping to deliver. “Energise Africa uses the power of technology to create accessible investment products that enable people to invest from as little as £50 directly in pioneering solar businesses that install life-changing solar systems in homes. This provides affordable economic opportunities to families, while generating up to 6% annual returns for investors.